Lewis Hamilton has finished both Friday practice sessions for the 2015 Canadian Grand Prix as the fastest driver. It wasn’t as simple as it seemed for the British driver however after he had a minor collision with the wall after aquaplaning off track in wet conditions in second practice. After an awful end to the Monaco Grand Prix weekend, Lewis Hamilton was looking to bounce back at the sight of his first Grand Prix win in 2007. He outlined his intentions early on by taking the fastest time in a dry first practice session. Despite a spin at the hairpin, Hamilton would go on to finish 4 tenths faster than team-mate Nico Rosberg. 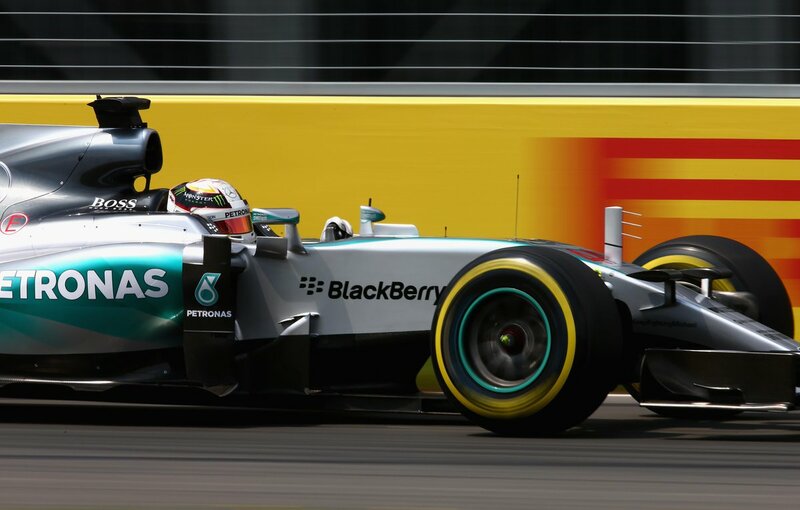 The pair had been separated by a mere hundredth of a second prior to Hamilton setting a better lap. A trend of recent races has been for Mercedes to lead the way ahead of Ferrari. This was not the case in first practice as Mercedes powered teams Lotus and Force India took 3rd and 4th with Romain Grosjean and Nico Hulkenberg. They were both over a second and a half slower than the Mercedes duo however as the Silver Arrows demonstrated their straight line capabilities and overall pace at the Circuit Gilles Villeneuve. Sebastian Vettel, the usual closest challenger to Hamilton and Rosberg, finished the session in 5th for Ferrari ahead of Felipe Massa and Daniil Kvyat; the first Renault powered car on the time-sheet in 7th. Pastor Maldonado put the second Lotus-Mercedes car inside the top 10 in 8th place, with Fernando Alonso just behind in 9th in the McLaren-Honda. Max Verstappen, who fought back against criticism for his Monaco GP crash in the run up to this weekend, completed the top 10 for Toro Rosso. He will take a 5 place grid penalty for the collision with Romain Grosjean 2 weeks ago. One McLaren finished inside the top 10, the other outside with problems once again. The session had barely gotten under-way before Jenson Button was crawling back to the pits stuck in 2nd gear. He would get back out on track later on to complete 25 laps in 15th place. Manor F1 team come to the Canadian Grand Prix with sponsors on their cars for the first time this year. Airbnb and TFI Friday have signed as backers and have their logo’s on the cars of Will Stevens and Roberto Merhi. The pair seemed to have reasonable pace in a straight line, as the pair were only 1.5 seconds off of 18th placed Marcus Ericsson for Sauber; a smaller margin than previously seen. The 2nd 90 minute practice session got under-way with every single car getting out on track very early due to rain closing in on Montreal. Most of the drivers went out on track with the faster super-soft tyre compound, with the likes of Lewis Hamilton soon coming in to switch over had they started on the slower compound. Ferrari duo Vettel and Raikkonen topped the session after making their way out onto the super soft tyres very early. Nico Rosberg soon put in his effort on the faster compound but could only get within a tenth of Vettel. Ferrari continued to show good pace on the brief long run race simulations they conducted. The simulations seemed to suggest that whilst Mercedes will have the edge in qualifying tomorrow, Sunday’s race could see Ferrari a little closer. Lewis Hamilton was one driver who originally came out on the slower soft compound. He was soon asked to come in for a tyre change as the rain was getting closer. When the team bolted on the red walled tyres it took a few laps for him to put in a good lap. His first competitive lap was spoiled at the final chicane after Hamilton missed the first apex and subsequently clattered the 2nd kerb. He managed to keep himself from becoming the first victim of the ‘wall of champions’ this year and would go on to set the first time in the 1’15’s this weekend. This put him at the top of the standings as he had been in the 1st session. The rain began to fall just over half an hour into the session. As the rain got heavier, more cars peeled into the pits. Soon the track was quiet once again with no cars circulating. The conditions were initially neither wet or dry enough for any meaningful data collection. Once the circuit was wetter, Mercedes decided to put their two drivers out on track. 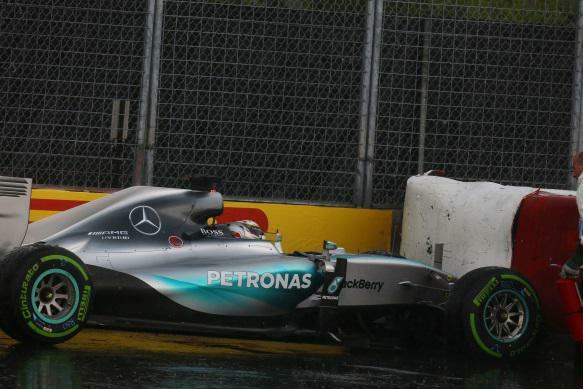 Lewis Hamilton was on intermediate tyres, but the conditions looked as though they were too too much for the tyres to take. This was proven correct as Hamilton aquaplaned slowly off the circuit at the hairpin and into the barrier. The contact was minor, but it was enough to break the front wing and force Hamilton to walk back to the pits. The red flag soon followed as a crane lifted the #44 car away and the safety car headed out for reconnaissance laps. The track was soon open once more, but no one would head out for the rest of the session. Due to the rain, no one would improve on the times set in the opening half hour of running. Hamilton would keep his P1 ahead of Vettel, Raikkonen and the 2nd Mercedes of Nico Rosberg. Lotus continued to show good dry weather pace in 5th place with Pastor Maldonado and 7th with Romain Grosjean. Valtteri Bottas was sandwiched in-between the two Lotuses, with team-mate Felipe Massa just behind in 8th. Red Bull completed the top 10 with reigning Canadian Grand Prix winner Daniel Ricciardo following team-mate Daniil Kvyat. The Russian’s car was scrutinized by mechanics with a suspected brake issue at the rear of the Red Bull.